Mark O’Sullivan makes a great catch for Kiltale against Harps during the Leinster Club IHC quarter final at Pairc Tailteann. Photo by Martin Costello. Kiltale (Meath) proved too good for The Harps (Laois) in this quarter-final fixture at Pairc Tailteann on Saturday afternoon but the win had its price. The Meath SHC champions lost Mark O’Sullivan to a straight red card in the fourth minute of stoppage time at the end of the game following an incident that also involved two Harps’ players. It bemused those on both sides. That harsh note means that the wing-forward is set to miss the semi-final clash with Ballyragget (Kilkenny) on November 18 at a Meath venue. Kiltale led all the way apart from the early minutes. 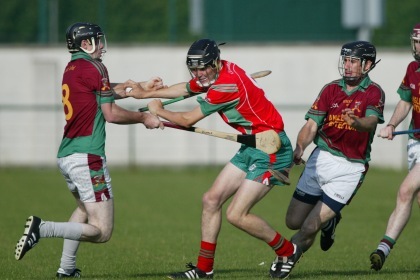 Not for the first time in a hurling match, both sides scored more when playing against the elements. Aside from the scoring exploits of Jack Regan (1-9), three important fetches near the end of the game by James Kelly – one on his own goal line – were memorable features of the win. In addition the work rate of Peter Durnin and Anthony Forde (the latter especially so in the opening half) also caught the eye. Padraig Delaney was The Harps main scoring threat but the Durrow-Cullahill outfit weren’t helped by seven first-half wides when playing into the town goal. Within 30 seconds of resumption, The Laois IHC semi-finalists were boosted by a Brian Clancy goal. The full-forward beat Ollie Regan to Eoin Clancy’s delivery and the deficit was down to four points. The Kiltale netminder might have been more proactive in dealing with Clancy’s speculative effort. By the 36th minute the gap was trimmed to a goal before Kiltale responded with five points in as many minutes to lead by 1-18 to 1-10. While the elements subsided somewhat, The Harps made another effort to cut the gap. They got it down to five points in the 54th minute when sub Ross Young left it 1-20 to 1-15. That score proved to the The Harps’ swansong before Peter Durnin (following the first of James Kelly’s catches) and Mark O’Sullivan closed the scoring. With the backing of the wind and the sun, The Harps pointed twice in the opening three minues. Padraig Delaney’s free was followed by a John Brophy effort from play. 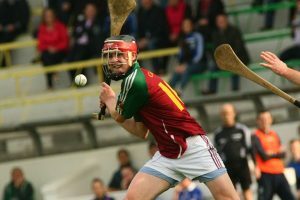 By the fifth minute the scores were tied for the only time in the first-half when Jack Regan (free) opened his account to go along with Cathal McCabe’s opener for the Meath SHC winners. Kiltale upped a couple of gears with four scores on the spin. Gavin Comerford’s point from an acute angle temporarily halted Kiltale’s progress. Then in the 15th minute James Kelly provided the assist for Regan to net at the hospital end to leave the board reading 1-6 to 0-3. Kiltale shaded the second quarter by 0-5 to 0-4. However they led by eight points, 1-10 to 0-5, after 25 minutes when Regan pointed. A Regan 65 completed Kiltale’s first-half tally. It was Conor Dunne – with his second pointed free from inside his own half – from close to his own 45 who left The Harps double scores in arrears at the break, 0-7 to 1-11. Kiltale – Ollie Regan; Anthony Donnelly, Philip Garvey, Ciaran Ennis; Ronan Ryan, Stephen Donoghue, Conor Shirren; Anthony Forde (0-1), Padraig Kelly (0-2); James Kelly, Cathal McCabe (0-2), Mark O’Sullivan (0-3); Peter Durnin (0-2), Cillian O’Sullivan (0-3), Jack Regan (1-9, 0-6fs, 2 65s). Subs – Ross Ryan for Shirren (ht), Adam Murphy for Garvey (51), Eamon Ryan for P Kelly (60), John Donoghue for McCabe (62). The Harps – Peter Walsh; Gavin Dunne, Pakie Flynn, John Prior; Daniel Comerford, Conor Dunne (0-2 fs), Richie Saunders (0-1); Eoin Clancy, Shane Phelan; Ciaran Comerford (0-2), Padraig Delaney (0-7, 6fs), Conor Brophy; Tommy Moore, Brian Clancy (1-0), John Brophy (0-1). Subs -Eoin O’Sullivan for Saunders (ht), Ross Young (0-1) for C Brophy (51), Michael Lannigan for B Clancy (51), Brian Dunne for E Clancy (54), David Doheny for D Comerford (55). Kiltale overcame a spirited Kildalkey to make it four-in-a-row SHC titles with a minimum margin win at Pairc Tailteann on Saturday afternoon. For the second year running the men in maroon claimed the Jubliee Cup by a single point. Cathal Sheridan’s men put a sluggish first-half behind them to overcome determined opponents who looked set to claim the title for the first time since 2011, when they won their third on the spin. Ultimately it was Peter Durnin’s excellent point – after he was re-introduced for the final minutes – in the second second of four minutes of added time that determined the outcome. James Kelly collected the man-of-the-match award and he deserved it having scored three points from play to go along with excellent ball-carrying. Kiltale were chasing the game until the final quarter when they capitalised on numerical advantage to become champions for the seventh time. Kildalkey were in a strong position when they lost influential defender Mairtin Doran to a second yellow card near the end of the third quarter. The scores were tied, 0-12 to the challengers 1-9, at the time. Johnny Greville’s men responded well to this immense setback. 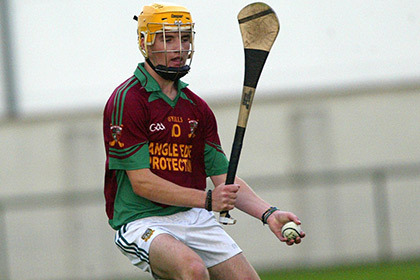 Conor Kearney posted three points on the spin – two frees and one from inside his own half – to move 1-12 to 0-12 to the good. Paul Fagan’s smart stop from sub Cillian O’Sullivan kept Kiltale at bay. Then, in the 52nd minute Mark O’Sullivan netted from Padraig Kelly’s sideline cut. But Kildalkey weren’t giving up. Conor Kearney had them back in front by 55th minute, 1-13 to 1-12. The challengers hit the ground running, taking the game to the four-in-a-row chasing champions from the off. In contrast, Kiltale seemed somewhat flat. Conor Kearney pointed from play before Padraig Kelly got Kiltale off the mark in the sixth minute. However, the men in maroon never regained parity in the first-half. Bidding for their sixth title, Kildalkey kept Kiltale at bay with Luke Rickard moving them 0-4 to 0-2 clear midway through the half. 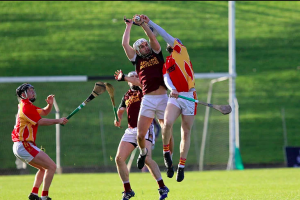 Kiltale recorded five wides during the first 15 minutes while Kildalkey received a tremendous boost early in the second quarter when Evan Fitzgerald lobbed Shane McGann from close range after MairtinA Doran and Padraig Keogh laid the foundations. At one stage, the challengers were six points to the good. Luke Rickard posted the final score of the half for Kildalkey who led by 1-8 to 0-6 at the break. A much improved Kiltale tore into the deficit from the resumption and by the 42nd minute the scores were tied for the first time when Mark O’Sullivan pointed with assistance from team captain Jack Regan. The sides were level on three further occasions before Durnin’s decisive intervention. Two goals in the second quarter from Fergal McCabe saw Kiltale ease to victory over their neighbours at a showery Kilmessan on Sunday morning. There were strong performances all round with Stephen Donoghue and Peter Durnin running through and handing off great ball to the younger forwards like Regan, Reilly and Ross Ryan who finished each move well. Durnin and Garvey linked up well all day and set up McCabe’s two goals with great moves that opened the home defence. Garvey was unlucky not to have two green flags himself but he had to settle for two points instead. Kiltale led at the interval 2-11 to 0-6. Kiltale’s midfield was very solid with Stephen Donoghue playing better than ever and with new man Conor McNally who scored an outstanding goal made a very good midfield pairing. The Kiltale defence was tight with the trusty full back line of Donnelly, Donoghue and Ennis back to their best. Ronan Ryan and Eamon Ryan swept up breaking ball with Conor Shirren cathching and winning ball at will to give the Kiltale’s forwards countless scoring chances. It was another good league win for Kiltale. Both teams were missing their county players. Kiltale now have much to ponder for the championship with many new players performing strongly and this will leave the management with a few team selections headaches which is a good problem to have coming into championship. Kiltale: O. Regan; A. Donnelly, P Donoghue, C. Ennis; C.Shirren, R. Ryan E. Ryan; C. McNally (1-0), S. Donoghue; R. Ryan (0-1), J. Regan (0-8), B. O’Reilly; P. Durnin (0-1), P. Garvey (0-2) F. McCabe (2-1). Subs used: J Cummins (0-1) for J Regan, M. Burke for R. Ryan, S. Lenehan (0-1) for P. Durnin, S. Cummins for F. McCabe. Killyon’s Calvin Ryan and Anthony Forde Kiltale strain every muscle to reach the ball during the Meath senior hurling championship final at Pairc Tailteann. Kiltale made it three-in-a-row with a minimum margin win over Killyon in the Ted Murtagh Meath SHC final at Pairc Tailteann on Sunday. The champions bid to retain the Jubilee Cup was severely tested. Despite falling behind in the third quarter Kiltale came good when the pressure came on. County man Jack Regan did not start. He was benched with a heavily strapped thigh. Introduced in the 56th minute, he delivered what proved to be the match-winning score from a 64th minute free. Only a goal was good enough for Killyon. A point from sub JJ Gilsenan closed the scoring with Killyon’s bid to end a gap going back to 2005 was over. Kilyon regained the lead through Peter Durnin’s 44th minute free, 0-13 to 1-9, and were not headed again. A Calvin Ryan point from inside his own 65 levelled matters. Kiltale wing-back James Kelly responded with his second score. Kiltale edged matters for the remainder. They passed up chances to flatline the contest, but Killyon were off target twice in the final minutes. First, Keoghan was wide from a free within his range. Then Adam Gannon had a goal attempt bravely smothered. Kiltale had the backing of the elements in the first-half, defending the town end. Within a minute of the off the defending champions had two points on the board from play. Ross Ryan was first to register with wing-back James Kelly getting the second. Driven on by leading scorer Keith Keoghan, Killyon worked their way back into the game. The scores were tied for the first time when Keoghan sent over from play in the 13th minute. Ross Ryan posted three three points from play in the opening half. The first of them put Kiltale back in front approaching the mid-point of the half. The scores were tied four times in the first-half, the final one when Cathal McCabe sent over for the holders and left it 0-7-each after 22 minutes. The champions were a bit more wasteful than the challengers in the first 30 minutes with Cathal McCabe passing up a goal chance midway through the half. Keoghan provided the final assist for the opening goal with a crossfield ball that unhinged the Kiltale defence and allowed Adam Gannon to net in the 23rd minute, 1-7 to 0-7. Two Durnin frees trimmed the deficit to the minimum. Adam Gannon replied for the challengers before pointed with Keoghan’s assistance. Durnin (free) left Kiltale trailing by the minimum, 0-10 to 1-8, at the break. Kiltale – Shane McGann; Anthony Donnelly, David Donoghue, Ciaran Ennis; Stephen Donoghue, Ronan Ryan, James Kelly (0-2); Iarla Hughes, Padraig Kelly; Fearghal McCabe (0-1), Cathal McCabe (0-2), Mark O’Sullivan (C); Peter Durnin (0-6, 5fs, 1 65), Ross Ryan (0-4), Anthony Forde (0-1). Subs – Eamon Ryan for Hughes (ht), Kevin Ryan for F McCabe (47), Jack Regan (0-1 f) for Durnin (56), Padraig Donoghue for Ennis (64). 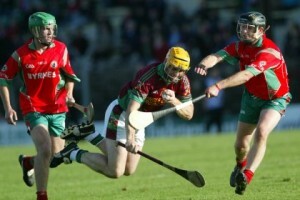 Kiltale were emphatic winners over Trim in the Ted Murtagh Meath SHC final at Pairc Tailteann on Sunday. Apart from brief lulls Kiltale dominated throughout and chalked up 26 scores with nine different players contributing to this impressive success. Both teams arrived at this stage on the back of five straight wins which suggested the likelihood of a close contest. Kiltale’s superiority ensured there was to be no nail-baiting contest. Jack Regan scored 0-10 (five from play) and deservedly took the man-of-the-match award. Kiltale were never headed and whenever Trim threatened a revival, Brian Gilsenan’s men responded appropriately. Team captain Peter Durnin also registered five points from play while his industry took to all part of the Trim half. When Trim got to within six points of the men in maroon shortly after the restart, Kiltale’s response flatlined the contest. The highpoint was Anthony Forde’s 43rd minute goal following a searing run through the opposition rearguard. Regan chipped in with a trio of points (two from play) while Stephen Donoghue’s second score started the sequence going. Trim captain James Toher led by example complimenting admirable work rate with 10 pointed frees. Only two other Trim men registered and Luke Moran’s 49th minute effort was one of the scores of the game. That left the board reading 1-17 to 0-8. In the final quarter Kiltale outscored Trim by 0-8 to 0-2 with team captain Peter Durnin completing their tally with two points deep into stoppage time. Leading by example team captain Peter Durnin pointed Kiltale in front within 50 seconds of the throw-in. He central to Anthony Forde’s score that doubled his side’s advantage. Mark O’Sullivan was also involved in that productive move. Playing with the sun at their backs and towards the town goal, Kiltale didn’t let up and were 0-5 to 0-1 ahead after 12 minutes when Stephen Donoghue became their fourth scorer. All bar one of Trim’s first-half tally came from James Toher frees. Alan Douglas’ 13th minute effort was the sole scoring contribution from another player in red in the first-half and left the board reading 0-5 to 0-2. When John Andrews’ men registered again, Kiltale were into double figures on the scoring front. By half-time they had seven different scores. The industry that led to the scores was also notable. The pick of Kiltale’s first-half points were a brace from play from distance in quick succession at teh start of the second quarter from Padraig Kelly. Brian Gilsenan’s men moved seven points clear on two occasions coming up to half-time. Their lead was up to eight in the second minute of stoppage time when Jack Regan landed a free from about 10 metres inside his own 65. There was still time for Trim to pull one back with Toher landing his fifth point of the half in the last action before the break when Kiltale led by 0-13 to 0-6. Trim the experinced Joey Toole for the restart and he went close to pointing a sideline cut after Toher sent over another free. The men in red wasted some more chances before Kiltale reasserted themselves and coasted to their fifth title and first since 2012. Kiltale – Shane McGann; Anthony Donnelly, David Donoghue (0-1), Ciaran Ennis; Padraig Kelly (0-2), John Donoghue, Padraig Donoghue; Eamon Ryan, Anthony Forde (1-2); Cathal McCabe (0-1), Stephen Donoghue (0-2), James Kelly (0-1); Mark O’Sullivan (0-1), Peter Durnin (C) (0-5), Jack Regan (0-10, 5fs). Subs – Kevin Ryan for McCabe (43), Fergal McCabe for S Donoghue (48), Ronan Ryan for J Donoghue (53), Ross Ryan for M O’Sullivan (55), Shane Lenehan for J Kelly (59). Photograph and match report via HoganStand.com. Kiltale kept there unbeaten run with a 6 pt victory over neighbours Kilmessan in this 4th round Meath Senior Hurling championship played in Ratoath. Kilmessan started the brighter and raced into a 1g 3pts to 3pts lead after a mistake in the Kiltale defence after a terrific save by county keeper Shane Mc Gann led to a Kilmessan tap in to put a goal between the teams. Kiltale responded with a great fetch by John Donoghue who offloaded to in running midfielder Cathal Mc Cabe who finished well to the Kilmessan net. 2007 captain John Donoghue was causing all sorts of problems at full forward and he notched up another two points and set up Jack Regan for a great point out on the left. The Kiltale half back line of David and Stephen Donoghue and Padraig Kelly began to dominate and they restricted Kilmessan to 3pts from frees before the break. Kiltale’s Jack Regan converted 4 more placed balls before half time and further points from Peter Durnin 2pts and one from midfielder James Kelly resulted in Kiltale going in at half time 1g 10pts to Kilmessan 1g 6pts. The second half Kiltale started brightly with two points from Jack Regan one a great effort out beside the dugout after great tackling by Eamon Ryan and Brendan Dixon to help force the Kilmessan defence into over carrying the ball. Daren Reilly converted 4 placed balls in the second half and the remaining 2pts came from Stephen Clynch introduced as a sub at half time for Tony Horan. Kiltale finished strong after losing Philly Garvey to a second yellow card after 15mins and played the remainder of the game with 14 men but young guns Eamon Ryan 2pts,Cathal Mc Cabe 1pt but 4pts between the teams. The introduction of Cillian O’ Sullivan home from Australia had a major impact and at full forward he hit over two outstanding points one out on the right and the second out on the left and he will look forward to playing with his brother Mark due home from America this week along with Anthony Forde. Young Kevin Ryan gave Kiltale that extra pace when introduced in the final quarter to help make up for the loss of Philly Garvey. Kiltale had great performances from the Donoghue brothers in defence Padraig, David and Stephen and they were well assisted by Anthony Donnelly, Padraig Kelly and Chris Reilly. At midfield Cathal McCabe and James Kelly made sure the forwards got a good supply of ball. In the forwards Brendan Dixon and John Donoghue made things happen for all the young players around them and Donoghue was unlucky to see his shot trickle wide after a great fetch on the edge of the square and with Kilmessan keeper Mark Brennan beaten. Young players Jack Regan and Eamon and Kevin Ryan and Cillian O’ Sullivan brought great pace and energy to the Kiltale forward line and they helped make up for the fact that Kiltale had only 14 men for the last 20mins. Kiltale: Shane McGann; Anthony Donnelly, Padraig Donoghue, Chris Reilly; Padraig Kelly, David Donoghue, Stephen Donoghue; Cathal McCabe (1-1), James Kelly (0-1); Eamon Ryan (0-2), John Donoghue (0-2), Peter Durnin (0-2); Jack Regan (0-8), Brendan Dixon, Philly Garvey. 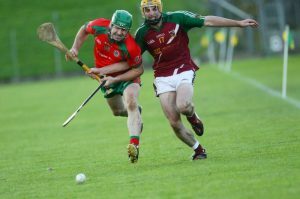 Champions Kiltale crushed last year’s runners-up Killyon in the second part of the Ted Murtagh SHC Group B double header at Trim on Saturday evening. Kiltale were in a league of their own here as they made it three wins from three in the campaign. Killyon lost their opening two games, but only by a combined total of three points. The sides exchanged points in the opening 75 seconds, but Kiltale quickly regained the lead and by the end had nine different scorers from play. Only Mark O’Sullivan’s goal separated the sides (1-14 to 0-14) in last October’s SHC decider. In light of narrow defeats in the opening two round more was expected of Killyon here. Jack Regan put the disappointment of the Leinster Under 21 H A loss on this pitch three days earlier to score 0-8 including some delightful efforts like the one from close to the left-hand sideline that made it 0-2 to 0-1. A tally of 12 wides to Killyon’s seven may give the Jubilee Cup holders something to work on. It was only in the run-up to half time that the gap in the scoreline became significant. Four pointed Keith Keoghan frees kept Killyon in contention during the opening 25 minutes at which point it was 0-4 to 0-9. By half-time the gap was up to nine points, 1-11 to 0-5 and continued to widen on the resumption as Kiltale doubled their first period tally after the interval. 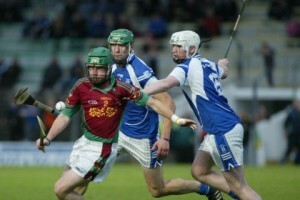 The second goal arrived at the country end in the 37th minute when Peter Durnin deftly connected with Eamonn Ryan’s delivery from distance and steer the sliotar past Stephen Quinn. By the 40th minute it was 2-16 to 0-6. Kiltale tagged on six points to Killyon’s three in the final third of the hour as the fizz evaporated from the fixture. Killyon’s final score from play was a point by corner-back Chris Reilly from the middle of the field early in the final quarter as the fixture drifted to an inevitable conclusion. Operating on solar power when playing into the town goal, Kiltale took just 17 seconds to get off the mark with John Donoghue registering. The scores were tied for the only time in the first half when Keith Keoghan landed the first of his four first period scores from free. By the time Keoghan sent over his second pointed free, Kiltale had registered five scores from play with as many different men getting on the scoresheet. For the champions seven different players pointed in the opening half including corner-back James Kelly. The opening goal arrived 25 minutes in with full-forward Benny Dixon finishing expertly when latching onto Kevin Ryan’s assist. All bar one of Kiltale’s first-half scores came from play while Regan landed a 65 in the last action of the opening 30 minutes. Killyon’s only score from play came in the 28th minute with David Raleigh sending over from distance with the help of Brendan Quinn. Kiltale – Shane McGann; James Kelly (0-1), Padraig Donoghue, Chris Reilly; Padraig Kelly, David Donoghue, Stephen Donoghue; Cathal McCabe (0-1), Phillip Garvey (0-3); Peter Durnin (1-2), John Donoghue (0-2), Eamon Ryan (0-3); Kevin Ryan (0-1), Benny Dixon (1-1), Jack Regan (0-8, 0-3 fs, 1 65). Killyon – Stephen Quinn; Andrew Feeney, J J Gilsenan, Thomas Raleigh (0-1); David Kennedy, Ray McKeown, Adam Flanagan; Brian Quinn, Ger Foley; Keith Keoghan (0-6 fs), Clayton Keegan, Joe Connor; Adam Gannon, David Raleigh (0-2). Subs – Calvin Ryan for Connor (24), Killian Canavan for Kelly (38), Tommy Fay for Feeney (38), Adam Farrell for Kennedy (44). Referee – Gerry O’Brien (Wolfe Tones). 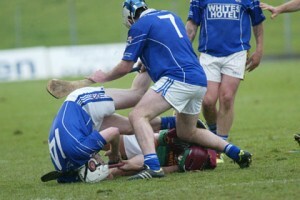 Nothing easy in the Leinster Club IHC. Kiltale’s James Kelly (obscured) is outnumbered by Olygate Glenbrien’s Eoin O’Mahoney (14) and Peardar O’Mahoney. Wexford Intermediate champions Olyegate Glenbrien staged a remarkable second half recovery to defeat Meath Senior Hurling champions Kiltale in the Leinster Club IHC semi final at Pairc Tailteann. After fifteen minutes Kiltale led by 1-5 to 0-2, their goal coming from veteran Johnny Donoghue. Jack Regan crashed a close in free to the Olygate net and further points from Regan (2) and Mark O’Sullivan had the Meath champions in cruise control leading 2-8 to 0-2 after 25 minutes. The Wexford champions staged a mini revival scoring three points in the last five minutes all from the hurl of midfielder Fergal Doran. Kiltale led at the interval 2-8 to 0-5. It was a different Oylgate Glenbrien team that took to the heavy sod at Navan for the second half. Within ten minutes the Wexford men had the gap down to a point with two goals and a point from the excellent Jamie Reck. Kiltale replied with a brace of points from Jack Regan. On the 20th minute half back Anthony Forde raced through the Glenbrien defence to score an inspirational point and the Meath men were 2-12 to 2-9 in front. But from there on Olygate took over. The outstanding Padraig Doran levelled the game with a goal and points from the Dorans, Fergal and Padraig had the Wexford men two points to the good. Jack Regan and MJ Reck exchanged points before the final whistle as Olygate Glenbrien went on the win by two and advance to the Leinster decider. Oylegate Glenbrien: Michael Shiggins, Adrian Nolan, Fergus Heffernan, Robert O’Connor, Daithi O’Mahoney, Michael Heffernan, Peadar O’Mahoney, Fergal Doran (0-8), Jamie Reck (2-1), John Foley, Peter Nolan, MJ Reck (0-1), Padraic O’Connor, Eoin O’Mahoney, Padraig Doran (1-2). Kiltale: Shane McGann, Anthony Donnelly, Padraig Donoghue, Ciaran Ennis, Anthony Forde (0-1), Willie Mahady, David Donoghue, James Kelly, Philip Garvey, Johnny Donoghue (1-0), Stephen Donoghue, Mark O’Sullivan (0-2), Cathal McCabe, Peter Durnin (0-2), Jack Regan (1-8). Kiltale’s Johnny Donoghue takes a tumble as Killyon’s Conor Foley and Paddy Ryan close in during the Meath SHC Final at Pairc Tailteann. MARK O’SULLIVAN’S 32nd-minute goal proved decisive as Kiltale edged out Killyon in the Ted Murtagh Clothing and Footwear SHC final at Pairc Tailteann on Sunday. O’Sullivan was the game’s top scorer from play with 1-3. His goal cushioned Martin Ennis’ men against a late Killyon rally that might have forced a replay but for some sterling defensive work by the new holders of the Jubilee Cup. When O’Sullivan steered Peter Durnin’s delivery to the net at the town end it left four points between the sides, 1-8 to 0-7. O’Sullivan was prominent in attack as Kiltale widened the gap to five points on six occasions. When Jack Regan, who was to the fore in the opening half, brought his tally 0-7 with a 56th-minute free, six points separated the sides, 1-14 to 0-11. This made the young corner forward the final’s top scorer. A late Killyon rally yielded points from Pauric McKeown (whose goal attempt just cleared the crossbar), Raymond Massey (free) and David Raleigh. The timely intervention of David Donoghue prevented Killyon from getting in for a late goal that would have forced a replay. This is Kiltale’s fourth SHC title and first since 2007 – a feat achieved despite losing the opening two fixtures (Kilmessan and Kildalkey) in the group stage. Killyon went in pursuit of their first SHC title since 2005, and eighth in all, on the back of six straight wins in this year’s campaign. At the game entered the final quarter Kilale ‘keeper Shane McGann fielded David Raleigh’s delivery well under pressure to prevent the concession of a goal. Kiltale lined with Ian Douglas and Anthony Forde at midfield while Killyon’s Pauric McKeown and David Kennedy were in direct opposition. Jack Regan landed an impressive opening point for Kiltale from close to the stand at the hospital end in the second minute. Killyon responded well with three quick points; a David Raleigh effort from play followed by two Raymond Massey frees. By the 13th minute the scores were tied for the second time following points from Regan (free) and Stephen Donoghue. Kiltale passed up a goal chance when Peter Durnin lost possession in front of goal. However, Martin Ennis’ men maintained momentum with points from Mark O’Sullivan and Regan (free). Killyon managed their first point in a quarter of an hour when David Raleigh sent over his second score from play in the 23rd minute. A David Kennedy delivery nearly led to a Killyon goal but Shane McGann and the Kiltale defence averted the danger. Killyon ‘keeper Stephen Quinn turned a Regan goal attempt out for a 65 which eventually led to Stephen Donoghue’s second point. Philip Garvey, operating in the half-forward line, made it 0-8 to 0-4. A Keith Keoghan effort ensured Killyon were within range of their opponents with 29 minutes gone. David Raleigh played a supporting role as Adam Gannon posted the final score of the half that left Killyon 0-6 to 0-8 in arrears at half-time. Within 40 seconds of the restart the margin was down to the minimum when Raymond Massey sent over a free from about 40 metres. Then came the game’s decisive score. Kiltale – S. McGann; A. Donnelly, P. Donoghue, C. Ennis; A. Forde, W. Mahady, D. Donoghue; J. Kelly, P. Garvey (0-2); J. Donoghue, S. Donoghue (0-2), M. O’Sullivan (1-3); I. Douglas, P. Durnin, J. Regan (0-7, 4fs). Subs – C. McCabe for Douglas (50), E. Ryan for Mahady (60). Killyon – S. Quinn; A. Feeney, B. Perry, B. Quinn; C. Foley, P. Ryan, T. Raleigh (0-1); K. Keoghan (0-1), D. Kennedy; P. McKeown (0-1), R. Massey (0-5 fs),J. J. Gilsenan; A. Gannon (0-2); C. Keegan, D. Raleigh (0-3). Subs – G. Foley for Quinn, A. Farrell for Kennedy (both 41), S. Kelly for Ryan (45). Kiltale were decisive winners in the second Ted Murtagh Clothing & Footwear Trim SHC semi-final at Pairc Tailteann on Saturday evening when ending Kildalkey’s bid for a fourth Jubilee Cup success in a row. The decisive moments occured in the ten minutes either side of half-time when Kiltale moved from being on level terms with the champions to being seven points clear. The game’s only goal arrived three minutes after the resumption with Mark O’Sullivan finishing to the net at the town end after Peter Durnin’s effort was blocked by Kildalkey full-back Stephen Forde. That left 1-11 to 0-9. Though Paddy Conneely pulled a point back from a free, White flags raised by Anthony Forde, James Kelly and Durnin was Kiltale’s response. 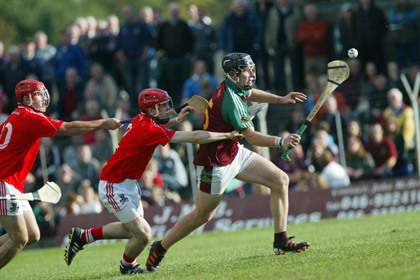 Following the latter score the board read 1-14 to 0-10 with 40 minutes on the clock and Kiltale kept Kiltalkey at arms’ length from there to the end. Kiltale – caught by an O’Mahonys’ smash-and-grab raid at the same stage last year – were only in arrears once, in the opening four minutes, on this occasion. Now they looked forward to their first final appearance since their 2007 success over Kilmessan. Six different players contributed to Kiltale’s tally with all bar four of their scores coming from play. Nine of Kildalkey’s scores were from placed balls. A tigerish Kiltale defence, with Padraig Donoghue a central figure, ensured there was no way back for Pat O’Halloran’s men. The introduction of Derek Doran in the 36th minute didn’t pay the required dividends on this occasion as goals eluded Kildalkey. Mark O’Sullivan put 1-2 to his name while Durnin finished with four points from play. No Kildalkey player managed more than a single score from play while Kiltale wing-back Anthony Forde managed two such scores. The sides went score for score in the opening 16 minutes with a Pauric Keogh point from play getting the proceedings underway. Kiltale replied with points from Cathal McCabe and Mark O’Sullivan to hit the front for the first time four minutes in. Martin Ennis’ men hit the front on four subsequent occasions in the opening 25 minutes but never by more than the minimum margin. With Paddy Conneely keeping the challengers in check with pointed frees the side were level five times in the opening 22 minutes. Kildalkey’s Noel Kirby had his side’s best goal chance of the opening half in the 12th minute when his close range attempt was smothered by Kiltale ‘keeper Shane McGann. Kiltale enjoyed a productive spell when posting four points on the spin in the second quarter to leave it 0-9 to 0-5 with 28 minutes gone. Mark O’Sullivan’s second point of the half was the pick of those scores. He cut in from the left before registering. A Kirby effort from play and Conneely’s fourth pointed free of the opening period halved the deficit before Regan closed the first-half scoring with an excellent effort from play. That left Kiltale leading by 0-10 to 0-7 at the interval having played with the breeze in the first 30 minutes. Kiltale – S. McGann; A. Donnelly, W. Mahady, C. Ennis; A. Forde (0-2), P. Donoghue, D. Donoghue; J. Kelly (0-2), P. Garvey; M. O’Sullivan (1-2). S. Donoghue, J. Donoghue (0-1); I. Douglas, P. Durnin (0-4), J. Regan (0-5, 4fs). Subs – C. O’Sullivan for Ennis (47), C. McCabe for Donnelly (52). Kildalkey – C. Flynn; E. Potterton, S. Forde, D. Lahart; M. Keogh, E. Keogh, M. Doran; S. Heavey (0-1), S. Corrigan; P. Geoghegan, N. Kirby (0-2, 1f), P. Keogh (0-1); G. Kelly, T. Fox, P. Conneely (0-9, 8fs). Subs – D. Doran for Corrigan (36), F. Doran for Fox (58).